Happy Summer everyone! Have you been getting lava hot nail mail? I sure have! It's over 110 most days here, and won't drop below 100 until nearly November. Oh the joys of living in the desert. Today I have two gorgeous polishes for you to feast your eyes on. 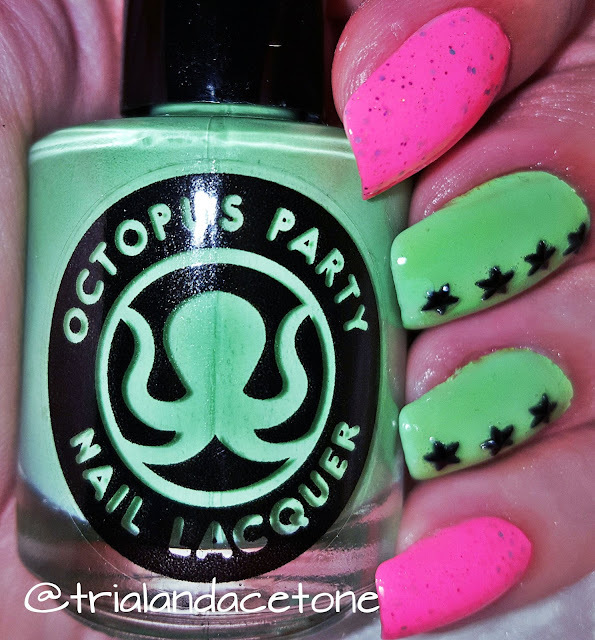 Up first is Octopus Party Nail Lacquer's gorgeous neon creme The Algae-atic Sea. This was OPNL's contribution to the Spring CALM (Crème à la Mode) Box and is also available in the Octo Shop RIGHT NOW!!. This color is definitely a notice me color, you will certainly get stares when you wear it; unless you're known as "that crazy polish girl" and people already expect you to bring the uniqueness! If you can't rock this at work because of "rules", then certainly try it on your toes! Perfect summer color! The other polish is a gorgeous coral glitter packed shimmer from Girly Bits, called Fragments. This was part of a duo for Harlow & Co's ONE series, where each month an indie maker creates a duo of polishes for a cause. Girly Bits made their duo for the Alzheimer's Society of Canada. I am not usually one who goes for this type of color, but it is truly unrivaled in my massive collection. You keep hearing about OPNL, so why not get some for yourself? Girly Bits is a Canadian indie, and while the exchange rate of USD to CAD is pretty sweet right now, there is a strike issue with Canada Post so the shop is currently closed. CALM Box is a quarterly box of 4 creme polishes, check out the FBFan page - the summer box colors have been revealed and swatches will be out soon! These are two indies that I LOVE! 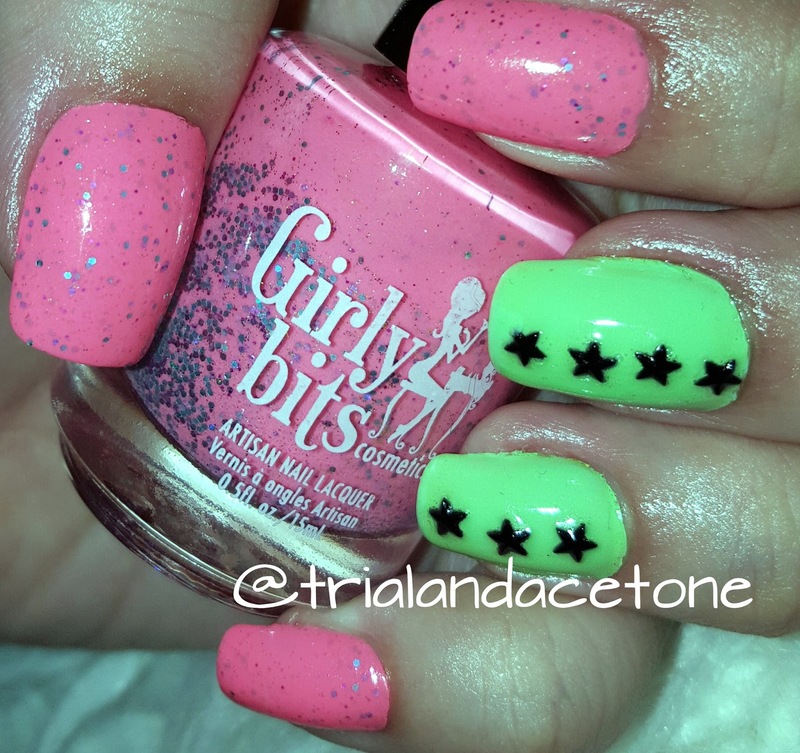 Lovely combo and I love that OPNL bright green!